According to Nielsen, alcohol sales growth is slowing in the United States overall, due in large part to an increasingly fragmented market. Today, consumers have access to an abundance of information, places to make purchases, and available products to choose from. 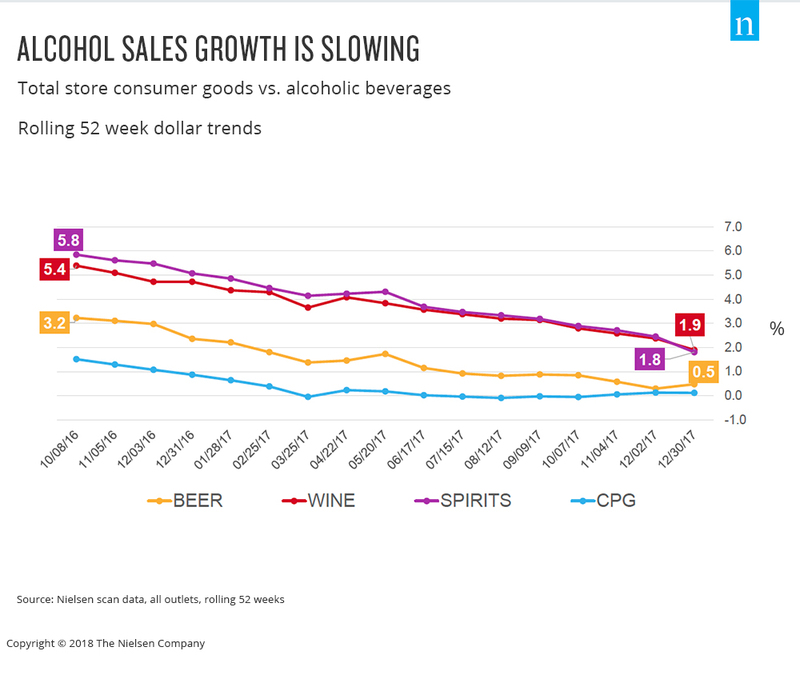 This makes it more challenging than ever for big alcohol brands to stay ahead on the retail front. However, there is one area in which alcohol sales are steadily growing: online. According to a report from investment firm Rabobank, U.S. online alcohol sales reached $1.7 billion in 2017. While the total dollar value is relatively small compared to in-store sales, growth within online channels is far outpacing that of brick-and-mortar retail. While e-commerce has traditionally presented challenges for alcohol brands due to strict state laws and shipping restrictions, it is now an increasingly viable sales channel. This is due in large part to the growing popularity of on-demand delivery services and in-store pickup options. Today, there are a dozen different e-commerce channels that alcohol brands can leverage to facilitate growth, from grocery and liquor stores to delivery apps and specialty online retailers. Here are six of the most important. Large-format brick-and-mortar grocery stores currently account for 25 percent of beer and spirits sales and 44 percent of wine sales in the United States. Therefore, as grocers such as Walmart and Kroger continue to develop their own e-commerce capabilities — and as consumers become more comfortable utilizing them — alcohol brands will likely see a significant lift in sales from the growing online grocery channel. This channel will be particularly big for wine and beer, according to the report, as several states restrict the sale of spirits by supermarkets. Wine also has the added benefit of its strong association with food. 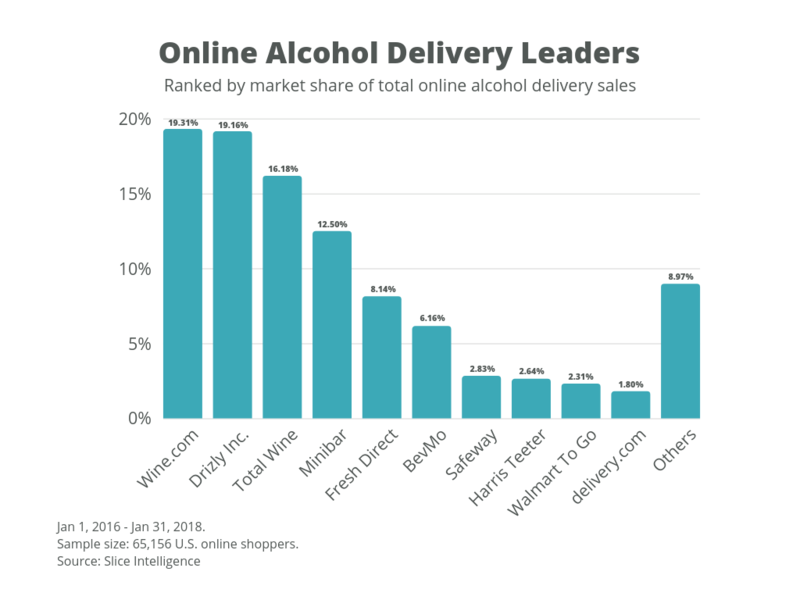 While liquor store chains don’t have as wide of a reach nationally as big grocery retailers, they still make up a significant portion of the online alcohol market. State laws and shipping restrictions can make it difficult for these stores to send alcohol across state lines, so many are expanding their e-commerce capabilities by offering in-store pickup and same-day delivery from local stores — much like grocery retailers. Total Wine & More, for example, captured 16.18% of online alcohol delivery revenue between January 2016 and January 2018, while BevMo captured 6.16%. According to data from Slice Intelligence, online alcohol delivery revenue grew 32.7 percent in 2017, increasing at an average rate of 3 percent month over month. December was the highest revenue-earning month in 2017, comprising 12.2 percent of annual sales. This growth is due in large part to alcohol delivery services such as Drizly. Drizly’s revenue grew by 61.8 percent in 2017. Minibar, a direct competitor of Drizly, saw revenue growth of 6.5 percent in 2017. In regions where Drizly and Minibar aren’t available, Instacart and Postmates are popular alternatives. Both Total Wine and BevoMo, for example, have partnerships with Instacart. While state regulations can make it difficult for retailers to ship alcohol across state lines, online-only alcohol retailers are still experiencing significant growth. Recent research from Rabobank, cited by The Spirits Business, shows that alcohol sales from online specialty retailers reached $975 million in 2017. Much of this revenue has been driven by online wine stores and clubs, as laws for shipping wine tend to be less strict than they are for shipping beer and spirits. Wine.com, for example, had the highest percentage of online alcohol delivery sales from January 2016 to January 2018, with 19.31%. Amazon launched Amazon Wine, an online wine store, at the end of 2012, but it shut down the marketplace in December 2017 after its acquisition of Whole Foods. According to The Drinks Business, laws regarding alcohol sales became complicated once Amazon acquired brick-and-mortar stores. Therefore, it decided to close the site and focus on other outlets for selling alcohol. Even without Amazon Wine, the company is poised to capture a significant share of the online alcohol market. Rabobank predicts that Amazon’s U.S. alcohol sales will follow the pattern that has occurred in Europe. According to One Click Retail, the company’s online alcohol sales grew by 96% in the United Kingdom and 230% in Germany in 2017. Amazon is now offering two-hour alcohol delivery in Seattle, Portland, Cincinnati, Chicago, New York City, San Francisco and at least five other cities via its Prime Now service. By leveraging the 300+ liquor licenses Whole Foods has, the company will be able to expand its reach even further. Blurring the direct to consumer model are companies like Naked Wines and Winc, which operate as licensed wineries and fulfill deliveries across the United States. Winc, a Los Angeles-based wine club, makes over 100 styles of wine starting at $13 per bottle. Customers fill out a six-question Palate Profile™ to asses their unique tastes, and each month they receive a custom selection of four bottles. Winc originally started in 2012 as Club W, a platform for millennials to find and buy good yet affordable wine. The company quickly faced fierce competition from other online wine clubs and specialty retailers, however, so it decided to start making its own wine as a way to give the brand a competitive edge. In summer 2015, the company hired seven vintners. The team’s first offering was named WKND, a sparkling wine. Today, all brands sold on the platform are made and owned by Winc. The company ships about one million glasses per month, and ten of its most popular wines are also distributed to shops and restaurants. Naked Wines’ 100,000+ customers (called “Angels”) fund small, independent winemakers. Each month, Angels deposit $40 into their Angel accounts. They can use that money to order wine whenever they want, and while it builds up, it’s invested in winemakers around the world. Naked Wines claims this business model saves customers 40 to 60 percent off their wine, as it removes a significant portion of costs that are traditionally passed to the customer. According to BeverageDaily, Naked Wines, a public company, brought in $38 million in reported revenue for the first half of 2018, selling 550,000 cases and amassing 100,000 U.S. members and a waiting list of 200,000. “The emergence of a low-cost DtC wine market, enabled by marketplaces and wine clubs, means that the DtC channel may start poking at the margins of producers like E. & J. Gallo, The Wine Group, and Constellation Brands,” Rabobank analyst Bourcard Nesin said. For alcohol brands to survive in this increasingly fragmented market, they must be familiar with the various e-commerce channels and have a dedicated strategy for each. 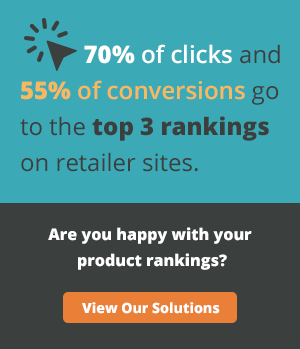 These strategies should include tactics that improve both discoverability and conversion. When it comes to discoverability, alcohol brands need to focus on appearing at the top of search results for the most relevant, high-volume keywords. For conversion, it’s important to invest in robust, high-quality product page content, including copy and images.